The amount of cash in circulation in the US is growing at over 10% per year, and with it the need for short term fixed income product outside of bank deposits. At the same time, treasury bills outstanding hit a new multi-year low this month. Recently issued floating rate treasury notes (see discussion) provide an alternative for bills, but the amount hitting the market is immaterial to make a dent at this stage. Money market funds also jumped into the Fed's RRP program (see discussion), but the supply of that experimental product is also limited for now. Private repo, one of the most common places for parking short-term cash outside of bank deposits, has been somewhat problematic as well. The supply of treasury collateral, large portions of which remain trapped on Fed's balance sheet, has often been insufficient. The recent rise in treasury settlement fails (failure to deliver) is an indication of such shortage. Investors looking to park cash outside of bank deposits can also buy bank commercial paper (CP), which is what most "prime" money markets have been doing. But banks do not like to rely on commercial paper for funding because many found themselves unable to roll it during the financial crisis. The volumes of bank CP therefore remain subdued (with rates declining as well). 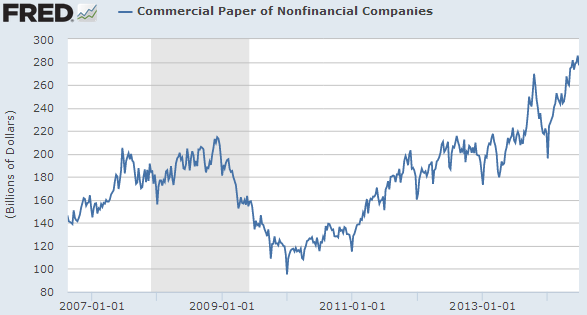 The only place where we can see substantial growth in short-term product volumes is corporate commercial paper. Highly rated investment grade corporations can borrow money for a month at as little as 5-7 basis points (annualized). With the CP market often cheaper than bank revolvers, a number of companies are using it to finance working capital. However, given the limited number of firms with ratings high enough to satisfy money market funds' requirements, the increased corporate CP volumes are insufficient to meet the rising cash management needs in the US.